General - which includes various areas like reporting on conflicts, developmental and environmental issues, civic issues, politics, etc. In 4 modules of 2 + 4 + 3 + 3 months, the one-year programme equips the new entrant for a flying start in journalism. The first 6 months are devoted to understanding and working in various media platforms, besides making students proficient in writing, reporting, editing and designing. These 6 months culminate with month-long winter training at various Times Group and select other leading media company newsrooms where they understand the expectations and work requirements of full-time journalists in a live 24X7 newsroom. Based on the learnings at newsrooms, the next 3 months are devoted to live projects (including creating newspapers, magazines, shows etc) and also subject specialisation. 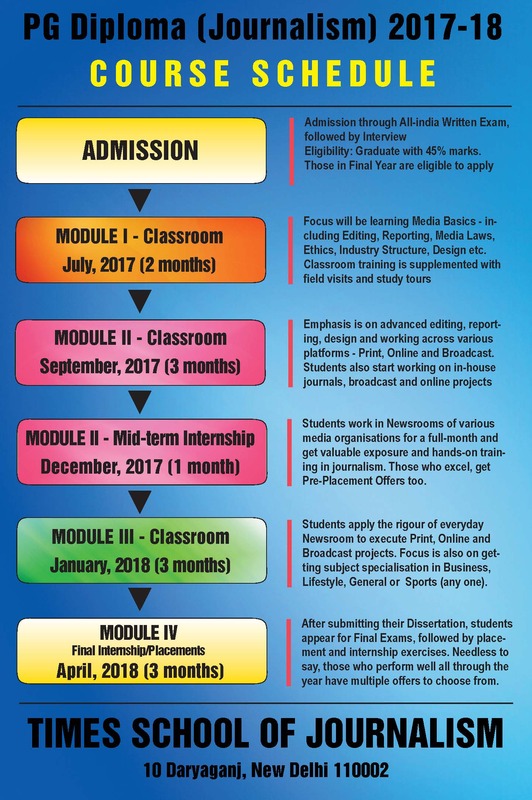 These 3 months are very crucial as they prepare students for the final internship – which exposes them again to a live newsroom for an extended period of 3 months – where they get the best of the opportunity to practice as equals and at the same time continuously being given hands-on training by senior editors across various newsrooms. The successful completion of internship paves way for award of the PG Diploma to students. Needless to say, those who excel at class-room training and durig internship, are readily absorbed by the group. Additionally, students are also provided placement to other leading non-Times group media organisations. Entertainment and Lifestyle - including fashion, food, travel, art and culture, etc,. Based on the learnings at newsrooms, the next 3 months are devoted to live projects (including creating newspapers, magazines, shows etc) and also subject specialization - carried out through a series of lectures and hands-on training by subject experts and senior journalists working with The Times Group and other leading media organisations. Students also get individual mentoring from these senior journalists and also get familiar with various newsrooms by doing live assignments. Aim: To identify and report business news with the objective of meeting the information needs of discerned readers and viewers of business publications/TV channels.Business opportunities are opportunities for investment, growth, marketing, innovative products, customer loyalties and so on. Business intelligence is intelligence that can be used by business magnates, entrepreneurs and decision-makers in government and industry. The objective of this specialisation is to provide students with all knowledge and tools needed for becoming a successful business journalist who can competently work towards getting relevant business news for any business publication or TV channel etc. Applied Communication: The newly-introduced subjects of Applied Communications including Corporate Communications/Public Relations will give students a working knowledge of the Advertising and Marketing functions and is helpful for those who want to specialise in niche areas of applied communication or even set up their own content production company. These will be taught by industry experts affiliated to Public Relations Consultants Association of India (PRCAI) who will endorse this course as an industry-accepted course to its members. Aim: To identify and report sports news and analyse sports and sporting events, players and sports bodies. The growth of sports from being merely a hobby for a few to a multi-billion industry has resulted in media companies paying special attention to sports journalism. This has also created a breed of journalists who eat, sleep and think only about sports. The challenge therefore is to identify students who are highly passionate about sports and then groom them in the art of sports journalism. Aim: To identify and report across a range of topics- including politics, human rights, environment, science, health, education, city news, etc. The growth of cities and the people living in these is an indicator of the ever-increasing need for news and information for a diverse and growing class of population. City and political reporting, which was earlier confined to areas such as municipality, crime, health, education, courts, assembly etc is now a multi-speciality function with subjects like heritage, horticulture, science and innovation, environment and climate, NGOs, transport, telecommunications, aviation, defence and many others being part of the diet of metro/political journalists. The growth of our nation and integration with global economy has brought about an ever-increasing need for lifestyle and entertainment news. Today, a newspaper is just not enough to satiate the demand for such diverse content and that’s why TV channels, radio programmes, internet sites, magazines, books and various other types of media are vying with each other to attract Gen-X by providing better and more in-depth content. The challenge therefore is to train young journalists or those young-at-heart in connecting with the Gen-X audience and speak to them in a language they understand, on topics which they are keen to know and also building a loyalty towards the media brand these journalists represent. Entertainment & Lifestyle specialisation specialisation aim to do just that by providing students with the best of opportunity to learn about these, which include topics like fashion, art & culture, heritage, food, movies, books, technology, etc. After successful completion of the class-room programme – stretching to over 8 months – students are sent on internship to the newsrooms of various Times Group and select non-Times Group brands spread across India. This 3-month internship gives students the opportunity to work with senior journalists and be a part of the team. Those who outperform are offered jobs even before their embark on their internships, while the rest get the opportunity to perform themselves in the live newsroom and get selected during the internship period. Only those who successfully complete their class-room education are permitted to go for internship or get placed – which is mandatory for getting the PG Diploma. Thus, poor academic performance, inadequate attendance, indiscipline, failure to work as part of team, insubordination or bad behavior towards staff, faculty or other students will mean termination of internship – which can be effective prior to start or during the internship period, thereby making the student ineligible for the Diploma. The opportunity to interact and learn directly at the newsrooms of India’s leading media brands during the classroom training, which is followed by 3 months of continuous internship at location and a brand chosen by the students, is in itself an invaluable experience – which most media/non-media run schools do not offer. As per our rules, if a student gets a confirmed job-offer from any mainstream media company (including Times of India Group) as a journalist at the start of or during the internship period, then the pre-condition of completing the full internship period can be dispensed with.